July 20th, 2017 (11:15 PM). Hey I cant patch it it says wrong input error and stuff what to do? Yeah, same here. This is just like last time lol. If I use the ignore option while patching, it seems to work fine except it gives me the 1m circuit board error which in turn doesn't allow me to save. You did use a FireRed 1.0 rom, right? July 21st, 2017 (12:32 AM). July 21st, 2017 (7:10 AM). Are you using a ups patcher and Fire Red 1.0? It works fine for me. July 21st, 2017 (7:23 AM). July 21st, 2017 (8:05 AM). I just changed the ups patch, see if it works now. July 21st, 2017 (9:32 AM). Love the features graphics seem nice but as this hack got only season 1 pokemon? July 21st, 2017 (10:15 AM). Thanks! This hack has gen 1 pokemon until you get the national pokedex, then you can start finding pokemon from gen 2 and 3. July 24th, 2017 (7:55 PM). Download in the main post! August 18th, 2017 (10:59 AM). Hey guys, if anyone wants to be a beta tester, join the discord server! August 27th, 2017 (1:44 PM). 7th Gym release is finally out! January 3rd, 2018 (4:40 PM). Edited January 3rd, 2018 by PokemonAce123. The 8th gym beta has finally arrived guys! Download is on the main post! January 3rd, 2018 (6:55 PM). Woaah! We got a new update! Thank you! I have a small question tho, How far along is the Elite 4 version from bring dropped? Also, is there a lot more content in the latest version? January 3rd, 2018 (7:18 PM). Woaah! We got a new update! Thank you! I have a small question tho, How far along is the Elite 4 version from bring dropped? Elite 4 version probably won't be out for a while, cause I want to make sure the hack is fully polished and bug free before I release the final version! Also, is there a lot more content in the latest version? Yup! This version has a lot more content than the previous versions! More team rocket action, ability to get some legendary pokemon, and other small stuff! January 7th, 2018 (10:34 AM). I got to a point in the first route where there was a trainer so strong that my Rhyhorn and I couldn't continue. I like the idea of this hack, though. January 7th, 2018 (11:57 AM). Is there any way to get out of Cinnabar Mansion? I already used the Escape Rope you find in there to get out once when my team was about to faint. How do I guarantee that I have a way to get out before I enter again? January 7th, 2018 (1:46 PM). To get out of the mansion, you need to find the exit...that's all I'm gonna tell you. Good luck! January 7th, 2018 (8:35 PM). For an unknown reason, after beating the first trainer after obtaining my starter, the game freezes when I run into a wild battle. January 8th, 2018 (6:48 PM). Maybe it's an emulator problem? January 12th, 2018 (3:41 PM). coming super close to beating the game, but i cant get onto nugget bridge. theres a guy there who says he wont move until i help celio on one island get the ruby and sapphire, but when i go to one island, a rocket grunt is blocking the way to go to mount ember. i seem to be stuck. what should i do next? January 15th, 2018 (12:48 PM). January 29th, 2018 (6:44 PM). I've decided that since this hack has shown significant progress, it shall be moved to the main Hacks Studio section! Congratulations! Join the PC Romhacking Discord today! February 11th, 2018 (8:43 PM). 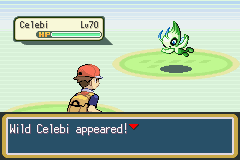 This just in: You can catch the amazing(ly cute) Celebi! April 13th, 2018 (10:31 AM). Hey guys! Just wanted to let you know that this hack is still very much alive and in progress! Here's a sneak peek of what we've been working on! April 20th, 2018 (7:37 PM). Wow! That new intro looks really smooth! April 22nd, 2018 (8:44 AM). Thanks! Less than two months to go (hopefully...) before Final Version 1.0 is out!